Let’s talk about the trend towards the humanizing of brands. Don’t know what we’re talking about? Well, just consider the shift towards nameless logos, for example. Nike kicked this trend off in 1995 when their swoosh began to appear with “Just Do It,” and, later, no words at all. Apple, McDonald’s, Coke and other brands followed, blazing the trail towards nameless logos. In part, this reflects the fact that symbols work better than words on screens and, of course, move across geographic and business borders more easily as well. But it also has a lot to do with the fact that it’s hard for big corporations to reach skeptical buyers. By pairing brands down to their most essential brand elements, big brands are rendered less corporate, more personal. In other word, they’re anthropomorphized and, thus, are able to evoke more human, immediate, and emotional, reactions. 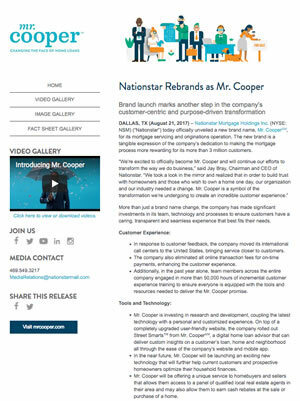 Recently, we distributed this release for Mr. Cooper (formerly known as Nationstar Bank). This simply takes this same logic one step further. After all, who wants to bank with Nationstar when they can have a friendly relationship with Mr. Cooper (who sounds like your favorite high school teacher)? But what does this move towards brand humanization mean for digital communications? Because you can’t chat up everyone you want to do business with, your social posts, e-newsletters, site voice, image choices and other brand elements establish the personality, the anthropomorphized version, of your brand. To offer up just one example of how digital assets are standing in for personal interactions, recent studies on the use of emoji suggest that emojis function like body language. Emojis communicate meaning, subtly providing new windows into mood and personality in lieu of hand gestures and facial expressions. Like nameless logos, these symbols immediately communicate human-esque emotions: happy, sad, angry, highly-caffeinated. Say for example, you ask your friend how she’s doing and she tells you she just fell down the stairs. So what to do with this info? Want to think through ways to humanize your brand without magic-ing up lofty budgets, new team members and updated logos? Write brand copy that sounds like a human. Try to avoid the grey mind-numbing boringness of corporate speak and bland business jargon. And whatever you do, don’t use acronyms! Don’t talk only about your brand. Really, do you really like people who can’t talk about anything but themselves? Many companies tend to talk about themselves and what their products or services can do. Everyone else, meanwhile, wants to know only what those products or services can do FOR THEM. Curate your look. You pay attention to how you dress, your hair, you highly-curated look whether you’re fashion forward or grungy, because you know people form opinions of you at a glance. The same holds true for your brand. So be smart about colors, graphics, images…all the small visual elements that create your brand’s look. Strong and consistent pays off.